The boys are cookin’ and steamin’ this morning! They first jump into their love for Preservation Hall in New Orleans, which leads into a very spirited discussion of their love of all things Jazz. They chat about their favorite jazz musicians, jazz albums, and even give off-the-cuff 5 jazz picks for anyone wanting to get into the genre. Dion waxes for his love of Frank Sinatra and breaks down the theory of the ‘concept album‘ and Frank’s connection, and after briefly touching on the history of how Blues legends learned how to play down in the Delta, Brian then presents the philosophical (or rhetorical) question of the old school musicians who learned to play in the smoky clubs or backwoods juke joints, versus the modern-day musicians who instead now learn their trade academically, in schools and universities- is there a difference in heart and feeling? And did the bitterness we saw in the 1960’s-70’s from some Blues icons toward the British-invasion white-bands justified? 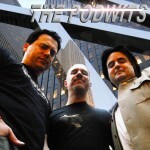 We’re improvin’ it all the way home in this brand new edition of the Podwits Podcast! Have a look at the iconic photos Photographer William Claxton took over the years of musicians and acting legends alike. Here’s a sample of the Preservation Hall Jazz Band‘s tribute album, featuring Tom Waits.